China has a vast sea area with the Bohai Sea, the Yellow Sea, and the East China Sea in the east, and the South China Sea in the south. The latter three border the Pacific Ocean. China's long coastline has ports in Shanghai, Tianjin, Guangzhou, Yantai, Qingdao, Qinhuangdao, Dalian, Beihai, and Hong Kong. These ports are vast and deep, with beautiful surroundings, making them another choice for sightseeing in China. China's mainland coast is over 18,000 km long, and its rivers total 226,800 km in length. China has a vast sea area - the Bohai Sea, Yellow Sea and East China Sea to the east and the South China Sea to the south. The Bohai Sea is China's inner sea and the Yellow Sea, the East China Sea and the South China Sea connect with the Pacific Ocean. Along China's long coastline lie Shanghai, Tianjin New Port, Guangzhou Huangpu, Yantai, Qingdao, Qinhuangdao, Dalian, Beihai, Hongkong and other ports.Today, there are more than twenty major coastal harbors in China. Shanghai Harbor ranks among the 10 largest in the world, with an annual capacity of over 100 million tons. Nanjing Harbor, with an annual capacity of 40 million tons, is China's largest river harbor. Such excellent natural conditions provide convenience for developing inland river transport and ocean shipping. The major inland navigable rivers in China are the Yangtze, the Pearl, the Heilongjiang, the Huaihe, the Qiantang, the Minjiang and the Huangpu, not forgetting the Grand Canal between Beijing and Hangzhou. People nowadays seldom choose Waterways to travel between cities, but they are still and always have been an important way of moving goods through the country. The Pearl River delta is a prime river system for the movement of goods and people. The system is filled with an absolutely amazing wide armada of boats, from barges to sampans to small fishing boats, to barges and hovercraft. Even today you will see a wide array of boats plying the various river systems. Sampans, long famous in China, are still seen in Hong Kong harbor and plying the waters around China. Barges of all types, laden with goods and materials as well as soil and rocks for many of China's development projects can be seen floating upon the waters. The Yangtze, the golden waterway of China's inland river transport, has considerable annual volume of both freight and passenger transport. Nanjing Harbor, the largest river harbor in China, has an annual capacity of more than 40 million tons. Ocean shipping in China is divided into two major navigation zones: the northern and the southern ones. The northern one has Shanghai and Dalian as the centers, and the southern one has Guangzhou as the center. Harbors (including inland river ports) built after 1978 have an annual capacity of 497.26 million tons. There are more than 20 major coastal harbors in China, with an annual capacity of 1.05 billion tons, and the passenger turnover of 64.01 million Shanghai Harbor ranks among the 10 largest trade harbors in the world, with an annual capacity of over 100 million tons. China has an ocean fleet with a capacity of 22 million tons of goods, sailing among coastal cities. These sea ports are wide and deep, beautiful in environment and can all arrange passenger-bookings for pleasure boats for world travel or to go ashore to sightsee and tour. 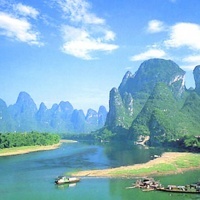 However, there are three famous waterways that foreign visitors should not miss in China. 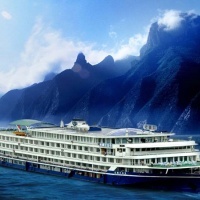 Yangtze Cruise: It passes the grand Three Gorges from the Baidi (White Emperor Town, Fengjie County in the west to Nanjinguan Pass, Yichang, in the east, a total at 193 km. Scenery en route are hundreds of relic and cultural sights and the breath-taking natural attractions. More details about Yangtze Cruise. Cruise along the Beijing - Hangzhou Grand Canal: Scenery on the way is mainly the unique water villages in south China and China's rolling tranquil countryside.